I LOVE peanut butter and chocolate. I usually like plain chocolate chip cookies but I thought these cookies were WAY yummy. One of the Four Year Old Classes at preschool is collecting recipes for a project. A sweet fun mom from my afternoon class shared this recipe. I was headed down to see my girls in Texas last weekend and I couldn't wait to try these. I love them. 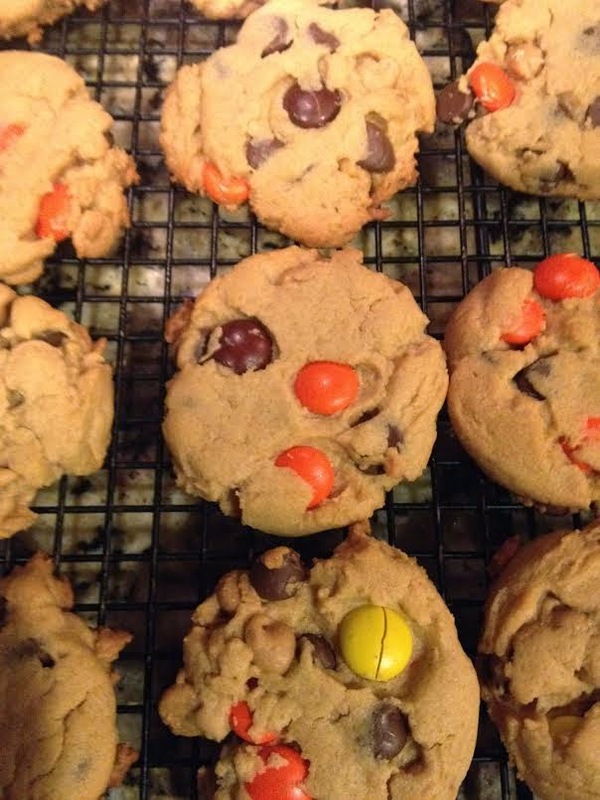 This is a great new recipe to add to my cookie repertoire. Give them a try!! In the bowl of a stand mixer fitted with the paddle attachment, beat butter, peanut butter, sugar and brown sugar on medium speed until light and fluffy, about 3 to 4 minutes. Add eggs, scraping down the sides of the bowl as needed. Add chocolate chips, Reese’s pieces and peanut butter chips and mix until incorporated. Roll a tablespoon or so of dough into a 1 inch ball between your palms and then place it on the prepared baking sheet. Repeat with the remaining dough, spacing the balls about 2 inches apart (you should be able to fit 12-16 cookies on each sheet). Bake 10 minutes. Remove from oven, let cool for a couple minutes and enjoy!